Two genuine deep relaxation methods from the Nyasa Tantra. Guided by Swami Janakananda. All you have to do is lie down still, close your eyes and follow the instructions. Also available in Danish, Swedish and German. Available in the USA and internationally at Amazon and Barnes&Noble. “Relaxation is a state, which is best achieved by using a technique that has been developed in order to trigger and maintain that state. During Yoga Nidra, the blood pressure is normalized, the immune system is strengthened and the brain slows down and cooperates. All organs and senses of the body are rested in a way that sleep seldom provides. Thus, the senses are sharpened and you feel invigorated afterwards. The more familiar you become with Yoga Nidra, the easier it is to glide into the relaxed state. And as you come to know harmony, you are soon able to instantly recall it, in the middle of daily activities. What makes Yoga Nidra so special is that it touches all parts of your being through the different methods it contains. After having made the body and mind thoroughly aware and relaxed, I use, among other things, the mantras (spoken sounds) and the visual symbols of the chakras to awaken and harmonise these fields of energy and consciousness. The Little Book on Yoga Nidra, included with the CD; 24 pages with a unique, expanded and revised text. It tells about the background of Yoga Nidra, and explains how to get the full benefits from the two relaxations. Experience Yoga Nidra: Guided Deep Relaxation is an effective help for stress management, mental training and for reaching the state of meditation. Scientific research done in London and Denmark in 2002 on the yoga teachers of our school, while listening to the CD Experience Yoga Nidra has shown that there is up to 65% increase in dopamine production while practicing by this CD. The first scientific study (with our teachers as subjects, listening to the Experience Yoga Nidra) was done in Copenhagen in 1999. It is published in the magazine Human Brain Mapping , Volume 7 Issue 2, pages 98-105 and online. I remain very impressed with the CD. I get a lot of solicitations and often do not respond to them because the quality is not always that good. This CD is more than the exception to the rule, hence my enthusiasm. I enjoy it not only because it was produced with quality, but because I can tell from the instructions and the voice guiding it that wisdom and experience, combined with a gentle strength and power, are leading the deep relaxation methods through Swami Janakananda. We had not expected the meditators to be able to control their consciousness to such an extent. 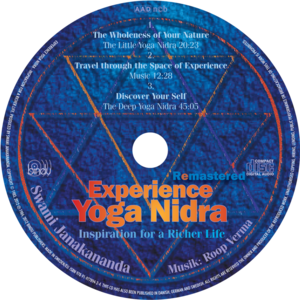 I have had the Experience Yoga Nidra CD for a month. I found the instruction on the CD clear and easy to follow. I do the long version each morning first thing and early evening I do the short version and follow with meditation. I definitely feel more relaxed and cope better with everyday setbacks even this early. And the effect seems to be cumulative. The yoga nidra is a joy to do and I haven’t needed any self discipline to keep me motivated. I wish I had found the CD years ago as I have suffered from depression a long time and I really believe that yoga nidra is helping already. 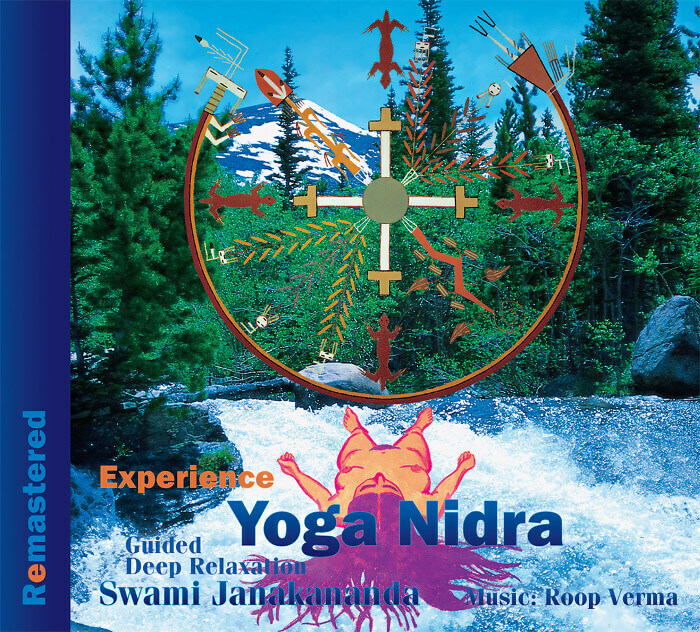 Once again, thanks for the Experience Yoga Nidra CD. At home, I use the CD 2-3 times a week. The relaxation effect is wonderful. I have realised that my verbal understanding is strengthened by practising yoga nidra. Memories and past experiences seep up and I discover that the way I am relating to myself is changing slowly but surely. My sense of self is strengthened – and I´ve become more and more caring (friendly, patient and permissive), also towards myself. It feels really good. Like the experience of finding peace and feeling eased now and then. After the course, I have continued to use the Yoga Nidra CD and found other benefits, such as reduced anxiety and better sleep. I am very grateful to Swami Janakananda for providing such a wonderful gift to humanity. Thank you. I am always more relaxed and energized and able to cope with the day better after I use the CD. I have given the CD as a present to many friends who have also found it very beneficial.